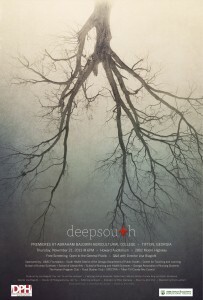 The award-winning documentary, “deepsouth”, will be screened in Howard Auditorium on November 21 at 6 pm at Abraham Baldwin Agricultural College. This viewing is free of charge and open to the public. The showing of this documentary is part of an effort by the ABAC Rural Studies faculty to open a dialogue regarding an important health issue in the rural south. This film is about the largely forgotten and interwoven issues facing the rural American South. Beneath layers of history, poverty and now soaring HIV infections, four Americans redefine traditional Southern values to create their own solutions to survive. The film is directed and produced by Lisa Biagiotti. Biagiotti will be in attendance at the screening to introduce the film and field questions during a community dialogue and question-and-answer session after the screening. Biagiotti has written and produced stories for the Los Angeles Times, PBS, Current TV, and Human Rights Watch. Her work focuses on complex, under-reported social issues, from the sanitation crisis in South East Asia to homophobia in the Caribbean. Biagiotti won the Robert F. Kennedy Journalism Award in 2009 for stories she produced on the humanitarian crisis in the eastern Congo. She teaches storytelling to first-time filmmakers and speaks internationally about digital journalism and independent filmmaking. She holds a master’s degree from Columbia University’s School of Journalism. This event is sponsored by the ABAC Foundation, South Health District, Center for Teaching and Learning, the ABAC Schools of Human Sciences, Liberal Arts, and Nursing and Health Services, the Honors Program, Georgia Association of Nursing Students, Rural Studies Club, SPECTRA, and the Tifton-Tift County Arts Council. For more information about this event, contact Troy Spicer, Interim Dean of the ABAC School of Nursing and Health Sciences, at 229-391-5020.